What springs to mind when you think about self care? Eating a delicious meal? A relaxing yoga session? Enjoying a massage or spa treatment? Do you even think about self-care at all? Finding time to look after ourselves can be hard, especially when other people depend upon our time and attention. 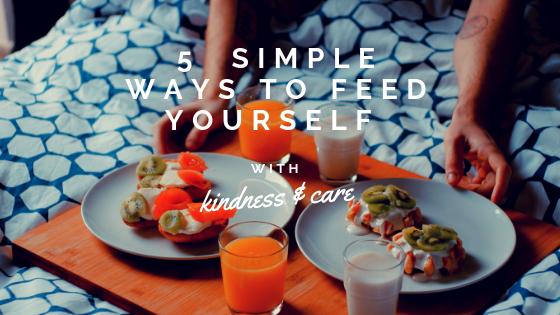 Yet we all have at least three opportunities for self-kindness and care every day: breakfast, lunch, and evening meal. Maybe you’ve fallen into the habit of skipping meals or eating hurriedly between meetings and appointments. Perhaps you don’t even care what you eat, so long as you refuel and can make it through the day. Such unkind eating habits do more than deplete your body of nutrients and are worth exploring to detect any underlying causes. Tiredness for example is often a reason for missed meals, but this will of course perpetuate the situation and worsen fatigue. Feeling stressed by an over-filled schedule is another possible reason. Depending on who organises your schedule, dealing with this factor may mean having an honest conversation with your boss, or creating space in your own diary to eat each day. Skipping meals forces your system to produce more stress hormones to support the levels of glucose in your blood that keep your muscles and brain working. A short burst of stress hormones is easily dealt with, but ongoing stimulation can contribute to some nasty health issues including high blood pressure and gaining fat around your middle. Eating too quickly can trigger all kinds of digestive problems: from indigestion and bloating, to pain, cramps, and Irritable Bowel Syndrome symptoms. Learning (or re-learning) to chew food thoroughly can alleviate a lot of digestive discomfort, and even help with maintaining health weight balance. Create time to sit and enjoy breakfast. This can be a small meal: a smoothie perhaps, or poached egg on sourdough toast. Whatever it is, be sure to sit down and take ten minutes to chew thoroughly and enjoy your food. Prepare a large pan of soup and freeze in individual portions so you have ready-made lunches for the week ahead. Make a mug of your favourite herbal tea, sit somewhere peaceful for twenty minutes and savour the flavour. Buy a vegetable you’ve never cooked before and find a new recipe for it. Let the rainbow in by including 6 different colour fruits & vegetables each day. Choose 1 from each of these groups: red, orange, yellow, green, blue/purple, and white. Feeling inspired? Do share your thoughts in the comments below, or over in the Facebook group – we’d love to hear from you!